A group for locals who want to have a say in how Byron Bay develops by keeping the social and natural environment of Byron alive. How dense do they think we are? 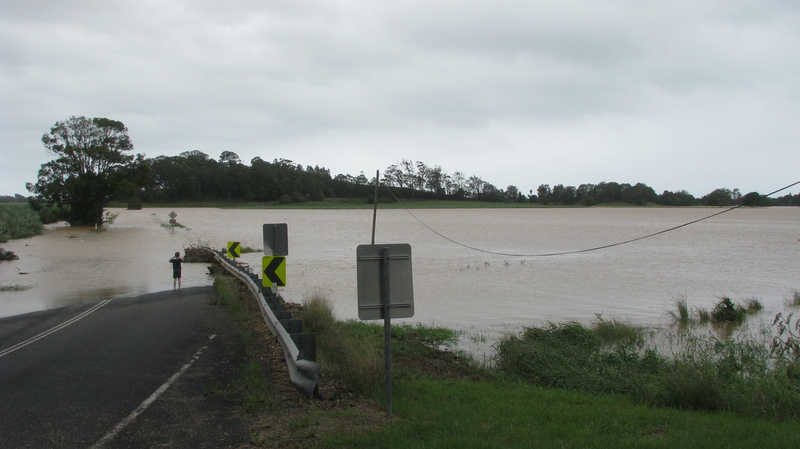 This image shows the Parklands in the floods of MArch 2017. The water rose very quickly in that area. North Byron Parklands are seeking to increase numbers for big festivals to 50,000 people. There are only 33,000 people living here. Permanent approval for the North Byron Parklands site means that our community will have no power to control what happens there. Having the state of NSW control the festival site is not consistent with the existing Planning Assessment Commission’s approved Concept Plan. After the trial period is over, Byron Council is supposed to grant any further approvals for holding festivals at the site. As noted in the PAC’s Final Determination Report, 24 April 2012, page 11: “Outdoor events following the trial period will require a further approval from Council under Part 4 of the EP and A Act”. 1. Control is supposed to revert to Council after the trial period. Having the state of NSW control the festival site is not consistent with the existing PAC-approved Concept Plan. After the trial period is over, Byron Council is supposed to grant any further approvals for holding festivals at the site. As noted in the PAC’s Final Determination Report, 24 April 2012, page 11: “Outdoor events following the trial period will require a further approval from Council under Part 4 of the EP&A Act”. It’s very important for Council to review all aspects of the trial period, in consultation with the residents who have been most affected by the festivals, to determine what should be done next. If Council decides to give further approvals, new consent conditions need to be set to reduce impacts on the people nearest the site. Stricter noise limits, better traffic management, better attention to illegal camping and security in residential areas, better protection for residents closest to the site, and better environmental management, are a few of the issues that need to be addressed. These issues are not adequately addressed in the proposal. Council needs to ensure that residents in the north are much better protected. One good example: Impacts of the festivals on Sensitive Receiver R12 on Jones Road have not yet been resolved in accordance with the current approval by means of attenuation or a mutually-acceptable agreement. The impacts on these residents have been going on since the approval was first granted, and the issues should have been resolved long ago. We should be deciding what happens in our shire. If this proposal is approved, the local community and its elected officials will again have been pushed aside, as they were by the Part 3A approval in 2012. The state will be in charge but will not be accountable to local residents. Byron and Tweed Councils will have no say. The DOP will continue “overseeing” the development from Sydney but will simply trust Parklands to manage everything. This is not right and not fair. Byron Council, in consultation with local residents and business owners, should be determining the shire’s destiny—not the state government. And much better protections for locals are needed. Permanent approval of this development is not in the best interests of the shire because it will bring greater numbers of tourists to the area. Byron’s tourism industry needs to be balanced with enterprises that are not dependent on tourism. Parklands wants permanent approval, but they don’t need it. The festivals have been operating profitably under a conditional trial approval for five years and operated for many years before that with year-to-year approvals from Council. If Parklands receives any further approval from the state, it should be conditional on annual reviews, and it should have to meet specific, rigorous conditions that Byron and Tweed Councils have set in consultation with local residents. DOP oversight of the trial has been lax. Parklands claims their compliance with consent conditions has been close to 100%, but locals have documented close to 100 breaches and other irregularities since trial approval was granted. The DOP has issued only a few Penalty Infringement Notices (fines) and Official Cautions (no fines) and does not even appear to have an accurate record of breaches and irregularities. (The DOP has not yet provided clear and complete information about breaches.) If the state remains in charge, oversight and enforcement will continue to be lax and inadequate. Recurring issues include noise, traffic, impacts on the environment, impacts on local infrastructure (roads, water, sewer systems) and impacts on residential amenity and health. Fire risks continue to be great, especially since the festivals have numerous bonfires and are located in a fire-prone area. Problems have arisen repeatedly throughout the trial, many unpredictable, e.g., the on-site traffic nightmares at Splendour 2016, recurring outbreaks of “festival flu”, unpredictable noise disturbance throughout the area, and repeated illegal use of fireworks on the site. Parklands may claim that all the problems have been identified and will easily be mitigated, but that’s pie-in-the-sky thinking. Much unpredictability remains. We can’t be sure what mess or disaster might develop because of the festivals. The proposed sewage management raises many concerns. Sewage is to be buried or sprayed on the Parklands site, which straddles two water catchments. Both tactics carry risks of contamination of ground water and surface water that will affect nearby residential areas and the Nature Reserve. On-site land formations and frequent site flooding both present major challenges to the planned disposal of effluent on site. Also, no provision is made for dealing with inorganic matter in the waste stream, e.g., sanitary products, plastics, etc., or for treating chemicals that become part of the waste stream, e.g., prescription drugs, over-the-counter drugs, and other unmetabolised chemicals. And it’s not clear if UV light or chlorine will be used to disinfect the waste and if the process will be fully effective. Parklands says they will implement their sewage treatment plans “progressively as budget allows” although a complete sewage treatment system was supposed to be in place by the end of 2017. So they’re not yet prepared to handle the sewage they generate. What they can’t treat on site will have to be trucked to overloaded sewage treatment plants in Byron Shire or elsewhere. This is not responsible management. Independent monitoring of key variables has not been done. To demonstrate their performance on key variables, Parklands hires consultants to monitor things and prepare reports. Parklands then sends the reports to the DOP for review. No independent monitoring has been done at any time during the trial. Parklands’ self-monitoring and self-reporting remains a major issue and will continue to be a major issue if this proposal is approved. Council needs to do its own independent review of the trial period. Those of us who have been monitoring the development closely will be glad to help with this. An independent cost-benefit analysis has not been done. No independent analysis has been done that objectively weighs the purported benefits of the festivals against the costs to the community. The Economic Benefits Report, Appendix W in the proposal, was generated by a Parklands-paid consultant. The report is presented “without the assumption of a duty of care to any other person other than the client [Parklands]” and the report further cautions any third party from “using or relying on the facts, content, opinions or subject matter” in the report. Experts in assessing economic costs and benefits have described the report as incomplete, inaccurate, and misleading. One point that Parklands does not address is how holiday rentals are significantly increasing in the north of the shire. These are making full-time housing more and more difficult for families to find and afford. Neighbourhoods are changing as non-taxed AirBNB properties sprout up everywhere. The proposed increases of site usage are significant. The proposed increase in festival use of the site is far from the “few days a year” that Parklands originally argued was their aim. Parklands proposes two large, five-day events and three medium-sized, one-day events every year. Each of these will require 35 days of preparation and dismantling, bringing the total site usage time to 188 working days or 52% of the year’s 365 days. And that does not include either the weekend (non-working) days associated with event set-up and dismantling and does not include the days devoted to “small” and “minor” events. If this proposal is approved, they will be able to get ongoing modifications to increase the numbers of days and the daily attendance still further. Their stated aim of 50,000 attendees per day has to be seen as only the beginning. The proposed conference centre is questionable. The originally-envisioned centre called for accommodations for 60 people. That has now doubled to a proposed total capacity of 180 with accommodations for 120. These facilities are to be used by staff during festivals and by paying guests at other times. This hotel/event centre is to be located in a forested area of the site where koalas have been sighted, most recently in 2016. Live Nation will not be accountable to Council and the local community. The two major festivals staged on the site are 51% owned by Live Nation, an American entertainment conglomerate. Permanent approval of this proposal will put profits generated at Parklands into the hands of that conglomerate, an entity that is not answerable to elected officials or local residents. Minimal funds for local Council; minimal benefits for the shire’s north. If this proposal is approved, Parklands will pay only $420,000 in Section 94 contributions. They suggest this can be used for improving the Byron Tourist Information Centre, redeveloping public toilets (presumably in Byron), additional beach showers and beach access improvement (presumably in Byron), public art, and “civic improvements” such as benches, footpaths, landscaping, and signage. That will be their contribution to bringing this massive development to the north of the shire—a tiny fraction of the profits that each festival takes in and not nearly enough to counteract the wear and tear on the north of the shire. Parklands’ investment is dwarfed by area homeowners’ investments. Parklands claims that their intention to invest $30 million in the site makes them a state-significant development. But a conservative estimate of the combined value of just the residential property in Ocean Shores North, South Golden Beach, New Brighton, Ocean Shores, and Brunswick Heads is $3 billion, as a local realtor has said. That $3 billion is surely more state significant than the $30 million Parklands plans to invest in festival-site infrastructure such as concrete platforms and wider roads. The environment is the true state-significant asset in this part of the state. Billinudgel Nature Reserve and Marshalls Ridge Wildlife Corridor, into which NSW has invested millions of dollars over decades, are the most state significant assets in the north of Byron Shire. Approval of this proposal will permanently change the nature of this ecologically-significant area—for the worse. The state should not have been approved festivals at Parklands to begin with. They now have a chance to correct that earlier mistake.